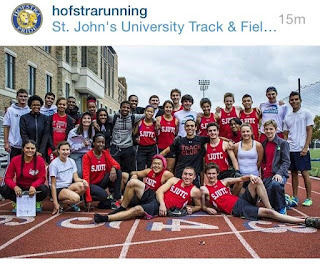 The Hofstra Running Club attended their first ever competitive track meet on Saturday, October 24th, as they traveled to Queens to take on St. John’s University Track Club. 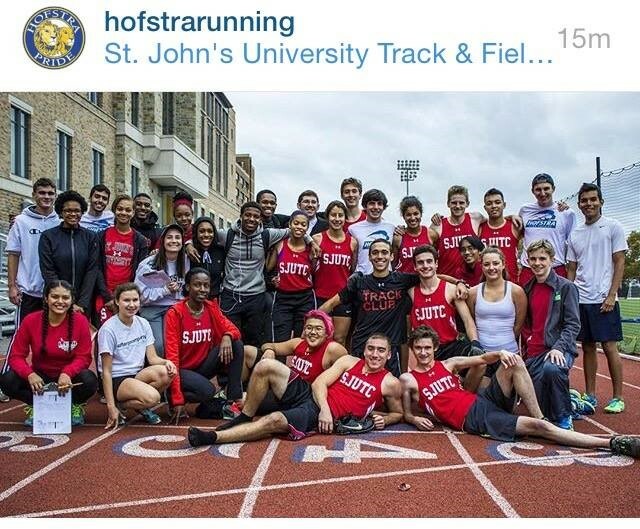 Eight members competed in races ranging from 100m to 1600m. Gary Williams placed 2nd in both the 100m (12.0 seconds) and 200m (25.9 seconds), as did Ryan Connell in the 800m (2:07.4) and 1600m (4:49). For most runners it was their first competitive meet in a while, and was a great stepping stone for the competitive indoor season, which begins in December. Hofstra Women’s Club Lacrosse participated in Stony Brook University's Breast Cancer Awareness Tournament on Sunday, October 25th. The Pride took on the host Seawolves in the first game of the day, battling their way to a fantastic 9-8 victory. Next up was NYU, who were also on the receiving end of the Hofstra ladies fine form, as Hofstra prevailed 8-6. Despite stellar defensive performances from Meghan Dempsey, Hope Knudsen, Liana Rodriguez, Jen Musumeci, Kita Wheeler, Alexis Sansone, and Kelsey Picciano, Hofstra fell just short of taking all three contests on the day, losing 8-3 to Fordham University. Goalie, Jazmine Gonzalez, was credited with a number of great saves, and the club was happy to play for such an important cause. Hofstra Club Ice Hockey brought home their first victory of the Fall campaign, with a big 10-4 win over local rivals Columbia. Hofstra maintained a 4-0 lead for most of the first period before a valiant comeback by Columbia evened the score at 4-4. Hofstra retaliated in style with 6 goals courtesy of Guiseppe Chiaravelle, who recorded a hat trick on the evening, Darren Schwartz and Eli Vailancourt, who each managed two on the night, and single goals from John Voilkis, Jamie Esperto, and David Craig. The Pride out shot Columbia 55-19. Hofstra Women’s Rugby Club saw their successful Fall season come to an end on Saturday, October 24th, with a tough quarterfinal playoff loss to SUNY Albany. Nery Mendez and Cheyenne Wong each scored tries and Margeret O’Callaghan converted a kick for the Pride, but unfortunately it wasn’t enough to combat the Great Danes as Albany came out on top 62-12. Congratulations to the team on a great season! Hofstra Equestrian Club added another successful outing to their season, this time traveling to Melville, New York, on Sunday, October 25th. Julissa Hoogeveen had a beautiful Open Flat round to start the day, placing 6th in a large and very competitive class. Kierstin Berwick had an impressive 4th place finish in Intermediate Fences. Julianna Foertsch had a great day; she earned 6th in Intermediate Flat and had a fantastic 2nd place ride in Novice Fences. Bridget McNamara also had a great Novice Fences ride, resulting in a 4th place ribbon. Kate Milford had another great beginner Walk Trot Canter round, resulting in a 4th place finish. The Pride’s Walk Trot division riders, Siobhan Stregis, Carrie Viscanti, and Angelina Purcell all ended the day strong - all three placed in their classes. Hofstra Men’s Club Lacrosse faced rivals Stony Brook at home on Saturday, October 24th, taking a quick 2-0 lead in the opening minutes. After a slight dip in momentum, the Pride came out strong once again in the second half, cruising to a 10-1 victory. Hofstra Roller Hockey Club competed in their first weekend of regular season contests with three tough games on Saturday, October 24th; two against Slippery Rock University and one versus Farmingdale State College. In the first match against SRU, the Pride fought their way back from a 5-0 deficit, as Nigel Grove netted two goals and one assist to pull the team within a goal. With the score at 5-4, Slippery Rock capitalized with an empty netter, ending the game 6-4. In the rematch that followed, Hofstra launched out to a 6-3 lead, but Slippery Rock mounted a furious comeback and went on to win the nail biting game 7-6. Hofstra fell to Farmingdale 4-2 in the third and final game, but the team showed tons of promise that they will look to build on for the rest of the season.